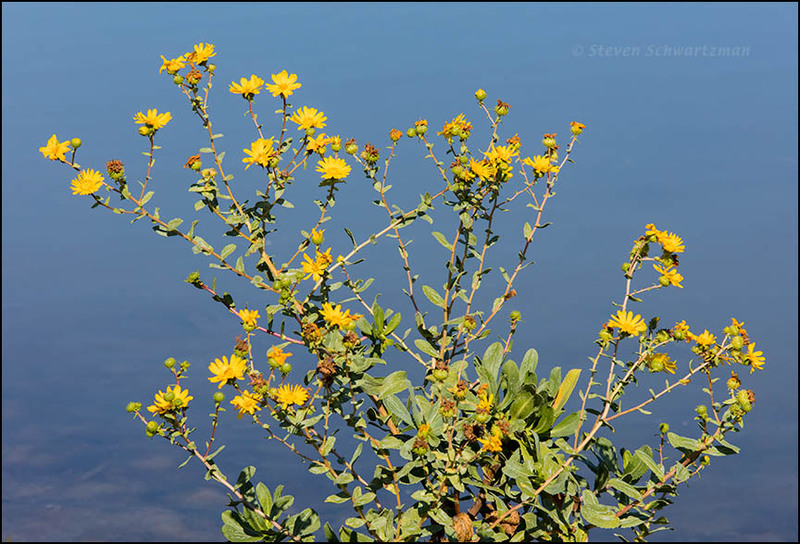 While walking in the wetlands of California’s Martinez Regional Shoreline on November 2nd of last year I saw many stands of a wildflower I assumed had to be in the genus Grindelia, whose members are generally known as gumweed. This one turned out to be Grindelia stricta var. angustifolia, called marsh gumplant. You are a gen(i)us, and a great photographer. Thanks, and good night from Blenheim. We passed through the burned areas along S.H. 7 and were slowed down (speed limit 30) by the firefighters still working there. It also took longer than we expected to get here due to road works that became more and more frequent the farther along we got. Hope that’s the worst over with. The firefighters are worried that the fires may flare up again tomorrow in the hot nor’wester which is predicted. We saw only one place where firefighters were still putting water on the ground, so let’s hope all the embers are out before a nor’wester blows through the area. Of more consequence for us were the road works I mentioned. There came a time when we couldn’t drive 15 minutes before being held up. Then we got to a seemingly interminable span where we couldn’t drive more than 5 minutes without being brought to a halt. What a relief when we finally reached Marlborough and the road became normal. A pity the roadwork issues weren’t featured prominently on the Land Transport site. If I’d known abut all the roadwork on S.H. 63 I might have opted for the route through Nelson, even though it’s a longer distance. I hope there was plain sailing this afternoon. The 3.5 hours of sailing went smoothly. However, we ended up among the very last cars allowed to drive off the ferry, some 40 minutes after it docked. It took us only half as long to get to our hotel, where we settled in and finished up the yummy tomatoes from your garden. Thanks also to Janaki for her jaggery. Fortunately no nor’wester has materialized here. Great. We had a nor’west sky late this afternoon but no wind as yet…. thankfully. What a delightful reminder of Kansas’s gumweed: Grindelia squarrosa. I have a little dried sprig of it sitting in a vase. Recently, a friend in the hill country told me that all species of Grindelia are useful for easing poison oak and ivy reactions. She says it’s become fairly common in Kerr and Medina counties. I went looking, and found this confirmation . I don’t think poison ivy’s mentioned specifically, but a search for “Texas Grindelia” turned up several posts by people who have used it successfully for poison ivy as well as poison oak. Gumweed flowers of several species are pretty common in Austin from late summer through fall. When I begin to see those flowers each year I’m always grateful that fall is finally on its way. I’d never heard of using gumweed to alleviate poison ivy, but the fact that a store-bought remedy is based on gumweed lends credence to the plant’s effectiveness. Fortunately I’ve never had occasion to use gumweed that way, and I hope I never do. I’ll keep gumweed in mind, although I haven’t had poison ivy since I was a child. I seem to not bothered by it anymore, as best I can tell. Hope I never have to find out! Like you, I hope I’ll never have to find out whether gumweed is effective against poison ivy. Fortunately I’ve never been afflicted, and I aim to keep things that way.